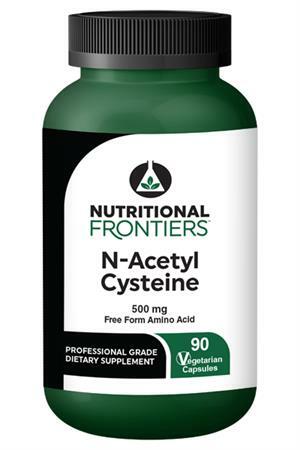 N Acetyl Cysteine (NAC) is a non-essential, free form amino acid that is a highly stable form of cysteine. N Acetyl Cysteine has antioxidant properties and is necessary for the production of glutathione. Glutathione helps the body cope with oxidative stress which is associated with disease, and improves the number and activity of immune cells within the body. The antioxidant and free radical neutralizing properties of NAC might also help it support pulmonary and cardiac function. NAC helps to support healthy lung tissue and the body’s natural defenses including cellular health. NAC helps to break down mucus in the respiratory tract and assists with rebuilding of lung tissue, and helps activate immune cells to improve immunity. N Acetyl Cysteine seems to be able to help clear mucus from the body as a result of several different mechanisms. NAC ruptures mucous disulfide bonds, which reduces viscoscity and it stimulates the clearance of mucus from the respiratory tract. NAC also may help maintain the inflammatory process within the normal ranges. Suggested Use: As a dietary supplement, take 1 capsule 1-4 times daily, with food or as directed by your health care practitioner.